If, like me, you feel the September release of the new Kate Morton novel is just a little bit too far away, you'll be happy to hear that there is a new novel by Hannah Richell. Following on from The Secret of the Tides and The Shadow Year, this third novel from the bestselling author is her strongest yet. 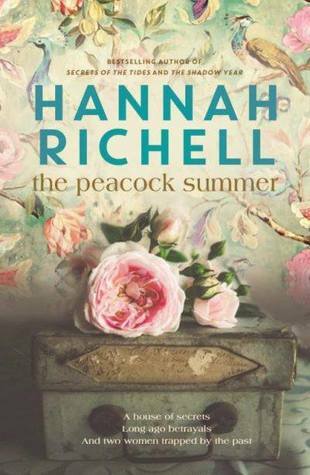 The Peacock Summer is the story of Lillian Oberon, who at 26 finds herself the wife of a rich and powerful man and lady of a beautiful manor house called Cloudsley. While life at Cloudsley is not as idyllic as it seemed on the surface, there are many things tying Lillian to the house, not least of which is the love she develops for her young stepson, Albie, who is the closest thing Lillian will ever have to a child of her own. When Charles, Lillian's husband, hires a local up and coming painter for an ambitious project that will see him moving into their house for a summer, Lillian's life is turned on its head and she is forced to confront certain things in her life which she had previously thought settled. Alongside this historical narrative, we are given the storyline of the present day in which Maggie Oberon returns to her childhood home to take care of her ageing grandmother, Lillian, who is beginning to lose her memory. Returning to Cloudsley means that Maggie must confront people from her past and try to make amends for the things that she has done. Along the way, she learns much about the strong woman her grandmother was, and the sacrifices she had to make, giving her much needed perspective on the events in her own life. This is a beautiful, atmospheric novel which captivated me from beginning to end-- it was near impossible to put down and had me up reading well past my bed time. The best parts of the novel were the historical portions, and I thought Richell did an excellent job of setting up the situation for her characters without making any of it seem melodramatic. She also captured the glamour of the age, from the fashion to the dinner parties to the cars. In comparison, the modern day storyline almost felt unnecessary at times, and it was hard to spend time away from the beautiful 1950s love story that had been set up. The modern storyline however gave some balance to the dark elements of the historical portion, and without the possibility of happiness in the future, the events of the past may have been difficult to take all at once. Evoking some of my favourite multi-linear historical novels, The Peacock Summer perfectly satisfied my historical fiction cravings and demonstrated what strong and unrestrained writing could do. Read it this weekend-- you won't regret it.